I gave 10 talks this week, the week right ahead of NASA’s 60th anniversary. 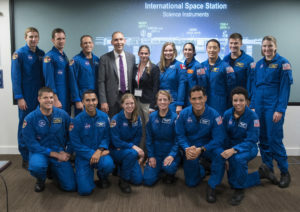 1) I gave a talk about NASA Science to the astronauts in training. This team of exceptional leaders stand for one of the key activities NASA has been about from its inception – the human space program. As the leader of NASA science, we do not see this program as competition, but a crucial part of NASA, enabling science we would never reach elsewhere. Some of these astronauts are not US Citizens, a testament to the fact that NASA does not see leadership and cooperation as a contradiction. 2) I gave a talk at a Foundation, which seeks to build bridges between the US and Switzerland by supporting young leaders. My team recommended that I do this, because the key audience were young, international leaders. To me, the most memorable part of this talk were two young female leaders. First, Aisha Bowe did a heart-felt introduction and told everyone how my mentorship helped empower her. Frankly, I struggled holding back my tears – it meant a lot to me and I am so proud of her and her achievements. I also met another young woman there named Lauren, standing next to me in the above picture. She led the charge to re-name her school after Buzz Aldrin. I spontaneously offered to take her to NASA HQ and she met all the astronauts. That was her lucky day ? Luck comes to those who innovate and work hard. So, I felt lucky to meet both of these young leaders. 3) My team had bi-lateral meetings this week with both Korea and China. Yes, we got congressional approval for one of these meetings, but we believe that NASA is a key part of the US diplomacy. We cannot work with all countries on all stages, but we seek to build bridges in science – we share the same planet, are warmed by the same star and look at the same night sky. That is why it is crucial to build bridges, just like NASA has done for 60 years. I want to point out something obvious: there is no way I can do these talks at highest quality without a team who works hard to keep our messages on target and our visuals fresh. Credit for my successful talks always goes to our team; blame for my botched talks go to me, because frankly, the preparation to each and every talk is at highest quality. Happy 60th anniversary, NASA – National Aeronautics and Space Administration!